Are We Less Violent Than Ever? 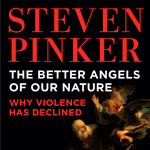 Stephen Pinker, the Harvard professor who a few years ago famously and fiercely opposed anything having to do with “faith” in Harvard’s revision of its core curriculum, has written a new book, The Better Angels of Our Nature: Why Violence Has Declined. The book has become much-quoted and much-reviewed and is worth our attention. Pinker makes this claim: “Believe it or not — and I know that most people do not — violence has declined over long stretches of time, and today we may be living in the most peaceable era in our species’ existence.” Of course, the implications of such a claim are huge. The book is, I suppose, anathema to postmodern pessimists, a darling to new-atheist determinists, and a surprising encouragement to those who still cling to Enlightenment rationalism. While I haven’t read the full 800 pages, I confess, I have read enough excerpts and editorials and reviews to get the gist. If you want to take a look at the latest article by Pinker on the topic, see, for example, nytimes.com/2011/12/18/opinion/sunday/war-really-is-going-out-of-style. All of this “bears on our conception of human nature,” Pinker says. “Human nature is complex. Even if we do have inclinations toward violence, we also have inclination to empathy, to cooperation, to self-control.” I certainly buy all of this. But what I do not buy in Pinker’s argument is that the age-old Christian commitment to character formation had nothing whatsoever to do with developing empathy, cooperation, or self-control, for individuals or for our society. Pinker wants to claim victory for the modernist Enlightenment project that reason will triumph in the end, despite the determinism that limits our options. Statistically, the point at which civilized states were brought into being, Pinker argues, the amount of violence declined. Pinker seems blinded to the world-shaping influence of Christian teaching: The call to kindness, gentleness, humility, forgiveness, love, that we find throughout Paul’s influential writing. If we take the teaching of the Christian faith seriously, and if we assume Christian teaching for centuries helped to shape our world, well, is it not possible to assume that violence will decline? I am not prepared or capable to challenge Pinker’s statistical models, though David Bentley Hart, in the most recent issue of First Things (January 2012), says that “Pinker’s assertion that a person would be thirty-five times more likely to be murdered in the Middle Ages than now is empirically meaningless.” I am, on the other hand, willing to accept Hart’s conclusion, because I find Pinker’s whole thesis something beyond common sense. The world is less violent, more peaceful, than it has ever been — does that make sense to you? What bothers me most here is that there is an operative dogma at work, a mythology, a “faith” that is presented as statistically verifiable “reason.” This notion of “progress,” that we are moving evermore closer to utopia, is the guiding mythology behind the Enlightenment, and when it infects the work of scholars, it is nothing if not biased scholarship. It is also an offense to our common sense, even as it calls on us to submit more deeply to its presuppositions. Well, I guess I don’t recommend reading the whole 800 pages either, though judging from the response in the public intellectual arena, this is an important book. Pinker’s book is yet another of the new-atheist’s attacks on Christian notions of human fallenness and the Christian path to human flourishing. For that reason, it is critical that we know what it’s all about.